A delicious range of pates really demands to be sampled by anyone with a taste for the good things in life. These fish pâtés are the all-time greats! 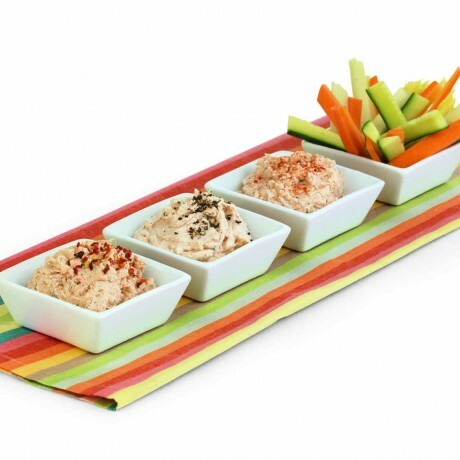 Fish pate recipes include delicious starters, great light lunches, canapé ideas, snacks, dips - the list is endless. They freeze extremely well and are great served in combination. If you want to jazz up fish pâté canapés a little topping of trout or lumpfish caviar is brilliant. All tubs are 115g, keep refrigerated for 10 days or suitable for home freezing for 3 months. Smoked salmon (fish)(scottish farmed salmon, salt) 48%, soft cheese(milk) (skim milk, cream(milk), skim milk powder, milk proteins, salt, lactic cultures, preservative (potassium sorbate)), lemon juice, horseradish, black pepper. Smoked Salmon (Fish)(Salmon, salt) 48%, soft cheese (skim milk, cream(milk), skim milk powder, milk proteins, salt, lactic cultures, preservative (potassium sorbate), lemon juice, horseradish, black pepper. Smoked Trout (Fish)(Trout, salt) 48%, soft cheese(milk)(skim milk, cream(milk), skim milk powder, milk proteins, salt, lactic cultures, preservative (potassium sorbate)), lemon juice, horseradish, black pepper. Kipper (fish)(herring, salt) 48%, soft cheese (skim milk, cream(milk), skim milk powder, milk proteins, salt, lactic cultures, preservative (potassium sorbate)), lemon juice, horseradish, black pepper. Mackerel(fish) 48%, soft cheese(milk) (skim milk, cream(milk), skim milk powder, milk proteins, salt, lactic cultures, preservative (potassium sorbate)), lemon juice, horseradish, black pepper.